Every presidential election year in my American Political Campaigns and Elections course, I get an opportunity to spend a full lecture discussing with students some of the famous moments from historic presidential debates. I explain to students that while the presidential candidate debates are supposed to be about presenting policy alternatives to undecided voters, almost no one pays any attention or remembers what the candidates say about policy. Instead the media covers the debates and voters interpret the debates in a winner and loser format. Which candidate connected to voters the best? Who had the best zinger or inspirational line? Some famous moments in debate history have reinforced the public’s negative perceptions of candidates, while other key moments have helped dispel such notions. Here are five from past presidential debates, chosen for their impact on the election campaign and outcome. Kennedy’s goal during the debates was to ease voters’ fears that he was too young and inexperienced to serve as president. Nixon, on the other hand, repeatedly emphasized his own foreign affairs experience in campaign advertising. While Kennedy appeared comfortable and confident in front of television cameras, Nixon famously declined to wear makeup, ended up sweating under the camera lights, and sometimes shifted his eyes, unsure where to look. 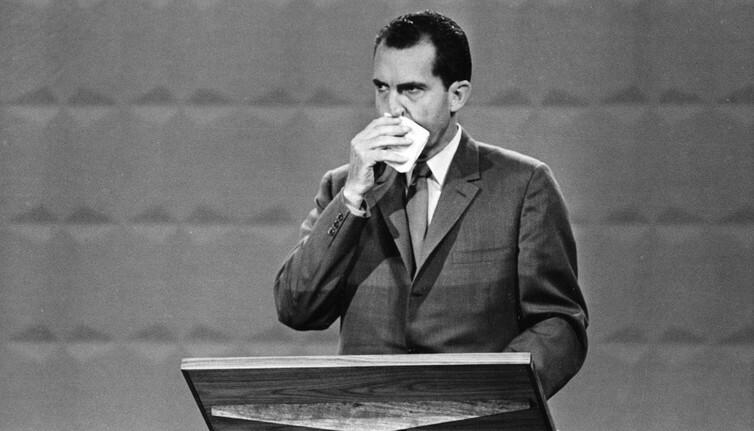 While the legend that Kennedy won the debate among television viewers and Nixon won the debate among radio listeners may be a myth, the debate did dispel the image that Kennedy was somehow less prepared than Nixon to be president. 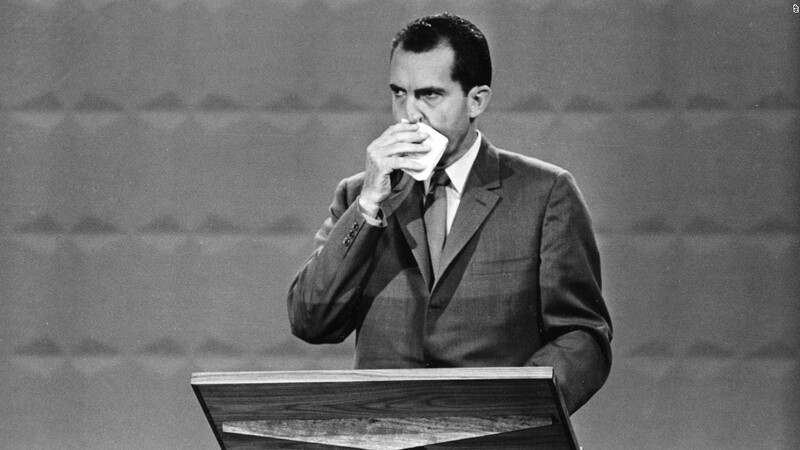 Richard Nixon wipes his face during the first televised presidential debate. The debates were delayed due to disagreement over whether John Anderson, an independent candidate whose polling numbers had dropped from over 20 percent to under 10 percent in the weeks before the election, should be allowed to participate. Carter and Reagan finally agreed to one debate a week before the election. But Reagan came away with the most memorable moment. After Carter mentioned Reagan’s past opposition to Medicare, Reagan tilted his head, smiled and said, “There you go again” to audience laughter – perhaps an attempt to dispel Carter’s attempts to make Reagan look dangerous. In his closing statement, Reagan then spoke to voters through the cameras and asked “Are you better off than you were four years ago?,” alluding to the state of the economy. Polls in the last week indicated a major surge in support for Reagan. Before the 1984 election, Reagan was 73 years old, already the oldest president in American history. Age was a potential issue for voters. During the first debate with Walter Mondale, the 56-year-old former vice president and former two-term U.S. senator, Reagan occasionally lost focus and seemed confused. After that first debate, Reagan’s large lead over Mondale in polls began to narrow. The audience laughed – Mondale included – and the media eagerly replayed and reprinted the joke. Reagan won in November in a landslide. During a 1984 campaign debate, Reagan turned the issue of age on its head. The 1992 presidential election involved the only three-candidate general election debates in American history. Incumbent George H.W. Bush needed to overcome an image that he was somewhat out of touch with recent problems in the American economy, an image partly shaped by media reports that Bush had seemed amazed at the technology of supermarket bar code scanners, which had been around since 1976. In contrast, Clinton had famously told an upset voter earlier in the year that “I feel your pain.” Ross Perot, a Texas multibillionaire, was not a Bush fan and was running a populist and centrist campaign focused on balanced budgets and opposition to trade agreements. The second of three presidential debates that year was held in a town meeting format. During the debate, Bush was seen on camera checking his wristwatch twice, giving viewers the impression that he would rather be somewhere else. And when an audience member asked a question that made no sense, mixing up the national debt and economic recession, Bush told the audience member that he didn’t understand her question, while Clinton walked over to her and invited her to tell him more about her economic problems. This debate reinforced voter images of the candidates: Bush seemed less interested in the problems of average people, while Clinton expressed compassion toward voters. At the first debate of 2012, Obama did not appear as energetic as usual and didn’t give any of the snappy answers that viewers expect and that tend to dominate media attention after debates. Following the debate, polls indicated that Romney had taken a small lead over Obama. But at the second debate, when Romney asserted inaccurately that Obama had not referred to the attack on the Benghazi consulate in Libya as an “act of terror” for two weeks, moderator Candy Crowley interjected to correct Romney’s mistake. Obama chimed in “Can you say that a little louder, Candy?” as Obama supporters at home reacted in delight at Romney’s embarrassment. 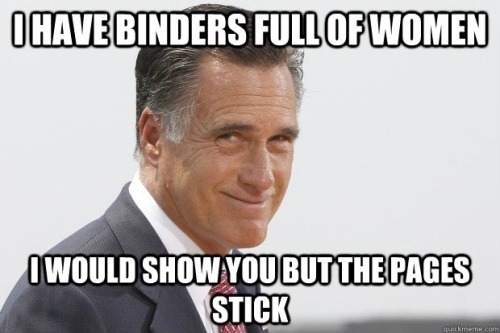 Romney compounded his unfortunate choices of words at the debate by noting that as governor, he had received “whole binders full of women” to consider for positions in state government. The awkward comment became an instant joke, with dozens of internet memes circulating in the days after the debate. Obama gets an assist from Candy Crowley. 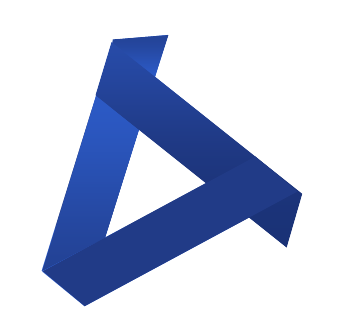 While we don’t yet know which comments or events at this year’s debates may affect the outcome of the election or remain memorable, we can expect that candidates will do their best to dispel negative images of themselves – while reinforcing negative images of their opponents. Watch for Hillary Clinton to focus on insulting comments that Donald Trump has made about people or groups and to focus on some of Trump’s past business practices: Trump University, the Trump Foundation and his casino businesses. She will also likely try to expose some of Trump’s populist claims – like Mexico paying for a wall on the border – as devoid of substance. At the same time, she will try to reinforce her own image as an experienced political leader. And watch for Trump to focus on past errors made by Clinton, like her foreign policy judgment, her use of a private email server and meetings with donors to the Clinton Foundation. Trump may also attempt to dispel his image as being inexperienced in world affairs by appearing calm and confident in his assertions, while pointing to past mistakes American leaders have made. He may also try to focus on some substantive and moderate policy proposals to distinguish himself from the bellicose firebrand he appears to be on the stump. The campaign staffs of both candidates have likely been rehearsing some zingers that could be used in the first debate. But candidates need to be careful about making them sound spontaneous. If they sound rehearsed, they’ll reinforce one of the worst qualities people can think of a candidate: that they’re fake.